The banqueting hall chairs were commissioned by James France of Bostock Hall, Cheshire and bear his arms of a 'hurst' with a shield charged with a fleur-de-lis and hanging from a tree. Their Grecian-scrolled form, enriched with ribbon-frets and embossed libation patterae, reflects the antique fashion promoted by the connoisseur Thomas Hope's Household Furniture and Interior Decoration, 1807; while their triumphal palm-flowered 'Roman' tablet rails correspond to one of his girandole patterns (pl.43). 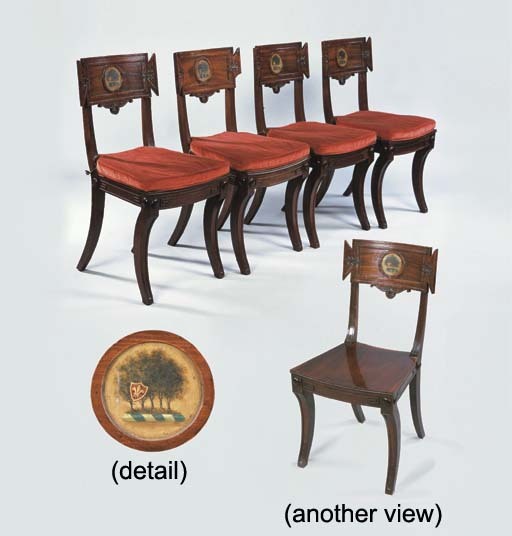 Similarly scrolled and sunk-fluted legs feature on chairs bearing the brand of the B.Harmer, who may have worked as a journeyman for a firm such as Messrs Elward, Marsh and Tatham (C. Gilbert,Pictorial Dictionary of Marked London Furniture, Leeds, 1996, p.33 fig 477).